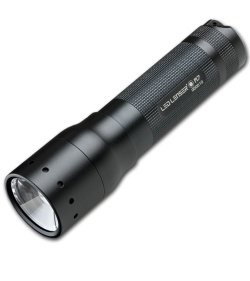 The LED Lenser M7 is a high power lighting instrument that puts out 220 lumens and a 650 foot beam of light. The M7 features the Advanced Focus System (AFS), which is the patented technology that combines a reflector and lens to create a light system that provides both a focused beam for long-distance and a homogenous spill-beam for up-close reading. The Rapid Focus system enables the user to quickly focus the beam with just one-hand. The Focus Lock system keeps the bezel from moving when holstering and unholstering throughout the day. The M7 has 3 light programs (Easy, Professional & Defense) with a total of 8 settings: Morse Code (or momentary-on), Boost, High Power, Low Power, Dim (stageless adjustment), Blink, S.O.S. and Defense Strobe. LED Lenser was founded in 1994 by twin brothers Rainer and Harald Opolka in their garage in Germany. Now LED Lenser has over 1000 employees, hundreds of patents and numerous design awards. There are a number of reasons to buy an LED Lenser flashlight, but one very good reason is that they stand behind their product with a five-year-warranty, wherein they will repair or replace the product and ship it back to you at their expense.